In VVVVVV, we take flipping for granted. It's nice, isn't it. Well... about that... there's this new player level called Operation Gravity. In Operation Gravity flipping is restricted. Not entirely of course, for that wouldn't be much fun. Don't worry, these levels are explicitly designed to make Viridian's journey a challenge. Operation Gravity begins as most levels do. Captain Viridian must rescue his friend from the circles, whose evils are as infinite as the number of sides they have. They have added a certain yellow block to their world. Viridian is unable to flip when on this block. Originally a glitch in VVVVVV, the circles have used it to their advantage. The Garden is the overworld of Operation Gravity. It contains misleading paths, shiny collectibles, vines, flowers and all else associated with a garden. The Garden is the only beauty... the circles destroyed the rest. I hope you enjoy Operation Gravity! Please comment below with any thoughts, compliments, or critiques. But please don't flip out on the chat... Oh Wait! Operation Gravity bans flipping. 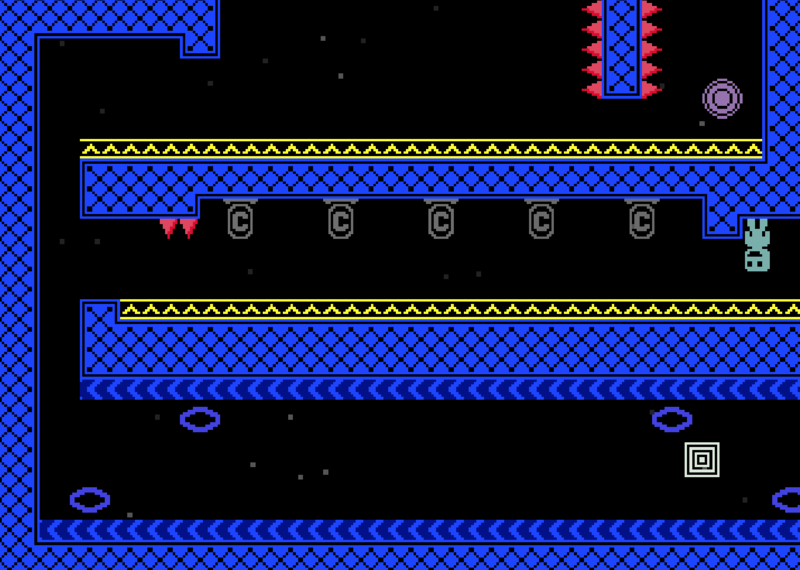 PS: Check out WWW, an outstanding level made by a friend of mine! It features 400 rooms filled with déjà vu and lots of fun. So, why are there two downloads? I have feedback in that the level exists. Looking into editor mode, there aren't any warp tokens leading there. I don't know about scripting, but if there was like a terminal teleporting into that location, I honestly think I would've found it a long time ago. It's possible - it's a puzzle trinket. Spoiler for solution under white text: You have to get Viridian *inside* the one-way tiles. To do this, flip from the top-left, then move to the right at juuuuust the right moment to get him stuck in the middle of the tiles leading to the trinket. You can still move left/right, and can go under the spikes and grab the trinket.